It has been confirmed that there are now a total of 19 moon bears in the wild (excluding one born in the breeding centre). 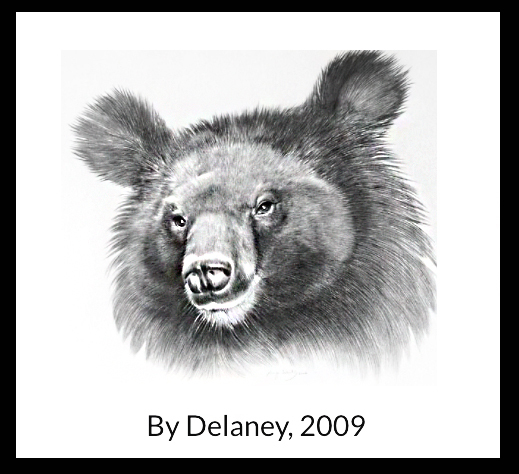 The photo (left) shows new born cubs- male and female -in the wild found on February 23, 2010. Each cub was 2 months old, weighed 1.5kg each and was confirmed to be healthy. According to Mr Yoon-su Lee (centre manager in the media department), the number of traps they collect from the Jirisan national park has decreased over the years.The team do trap inspections weekly and Mr Lee didn’t release the statistics of the exact number of traps collected in order to avoid unwanted criticism by the public. The traps, usually placed by villagers, are actually designed to catch wild boar to reduce damage but unfortunately, released moon bears have, in the past, been trapped instead. Traps have always been one of the biggest issues that the centre has had to overcome to revive the moon bear population in the wild. 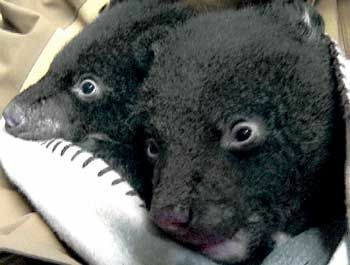 The web-published video is about the new cub-born on February 03, 2010- at the Jirisan centre. The mother was imported in 2004 from Russia and released to the wild but returned after failing the program. She gave birth to the cub 6 months after her return. The cub will stay with her for another 6 to 8 months and will be released into the wild by October 2010. This video footage is valuable in that it shows interesting information on the mother looking after its cub after birth. The Jirisan moon bear restoration centre is planning to increase the number of moon bears in the wild to a minimum of 50 in the future. This is wonderful work by all involved. Many thanks to Gina Moon for helping spread the word!